Mark Zuckerberg introduces Timeline at F8. 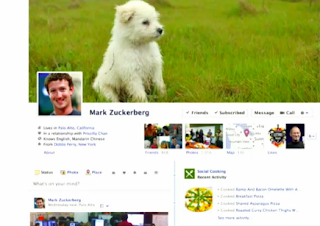 "Timeline is a completely new aesthetic for Facebook," proclaimed Mark Zuckerberg at yesterday's F8 — the Facebook conference where new products are launched and introduced. F8 stands for the eight hours that one dedicates to their passion projects — outside of one's regular job — in this case Facebook is referring to all their engineers on staff, (a Facebook version of Google's 20%, except it's not part of the work week hours). with new dog as his current theme photo. Yesterday the young CEO and founder of Facebook, announced a complete redesign of today's biggest international social network: the New Facebook. The simple luster of Facebook will now — for about its half a billion users — soon transform as a a thing of the past. In just a few weeks (and for developers it's available now), all the new products and an entirely different user interface for Facebook Nation will be live for everyone not just to try, but to engage with and adapt to, if they want to continue using it or to simply keep up with friends, loved ones and others alike on the network. For starters you will soon be able to have a theme image that hovers over your page at all times, which you can change as much as you like. 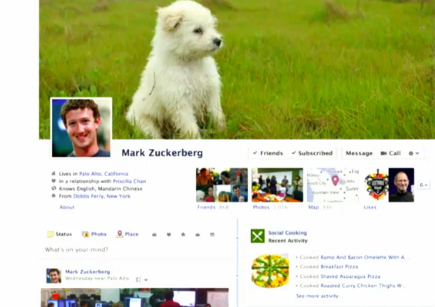 (See Mark Zuckerberg's example pictured at right, of his new dog). "You can express yourself in a unique way" claimed Zuckerberg, all the while asserting that "you can also have complete control over your privacy settings." SOCIAL MOVIE STREAMING: In next few weeks you'll be able to do movie-social-watching with your friends, announced Netflix CEO, Reed Hastings. 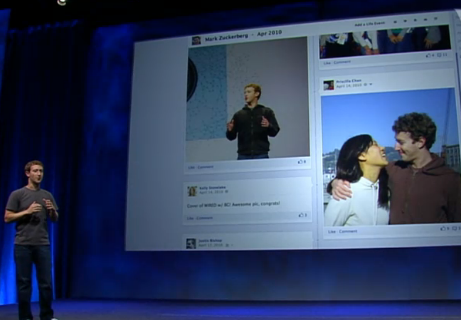 You'll also be able to use other video apps that Facebook has partnered with. MUSIC LIBRARY: You'll be able to have a whole music library via Spotify (among other music apps), in which social-music-sharing will also be integrated. TICKER: You'll soon be able to categorize your status updates under a light weight stream called Ticker, which will only feature your less important updates. And you can do this by adding a "verb" language. (This can be a really helpful, except if those who really should be using Ticker still continue to put their "light weight activity" under the regular updates, which will still read under, Recent Stories.) Ticker will also move faster than Recent Stories — in Twitter pace — to emphasize its lack of urgency and importance in the hierarchy of your feeds. 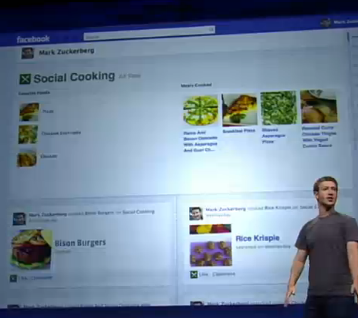 Facebook's Open Graph Lifestyle Section. TIMELINE: Your Timeline will be categorized by year. All your activities will be categorized by time. Older posts will now be replaced by Timeline, in which you'll be able to create what Facebook refers to as "Modern Scrapping," only digitally organized by time. MEDIA SHARE: You can share all the articles you're reading via other media outlets in a separate tab. Here you'll be able to showcase your media diet to your network. SOCIAL GAMING: You can play games with your friends on Facebook. Perhaps this one is probably the least alien of a concept out of everything in Open Graph, but it'll have some new updated features designed to be less disruptive. LIFESTYLE: You'll be able to have a page for activities you love to keep tract of: whether it's cooking (as pictured above right) or just all the foods you eat. You can document and showoff your workout sessions, your fashion outfits, or any hobbies you'd like to record on your Facebook pages really. mention in the The Social Network) first trip together. The young entrepreneur-turned-social-network-pioneer describes the new structure of FB as having "an in depth conversation with your close friends or someone you just met." In essence, all this information sharing is really living many parts of your life on the soon to be manifold Facebook pages you'll acquire, which means letting everyone know all different facets of your life activity presented in a timeline, hence the name. And Facebook doesn't feel strange at all about inviting its users of half a billion users to just that: To tell their entire network at all times their entire life story — live. From what music you're listening to, what movies you're watching, your workout schedule, your travels, what you're cooking this evening — "the patterns of your life" and your "real time serendipity," will all be in the Facebook scrapped pages for your enlarged social network to, review, ponder, and even engage with. Facebook — and more specifically, 27 year old tech mogul Zuckerberg — sees this as an opportunity to historically pivot the social-media-revolution into "the next level," as he calls it. Indeed, the question here isn't: Is Facebook ready to build a much larger social graph? The 66.5 billion dollar (Facebook's net worth via Forbes, 2011) question is: Are you ready to share an enlarged elaborate version of your life's Open-(Online)-Graph? 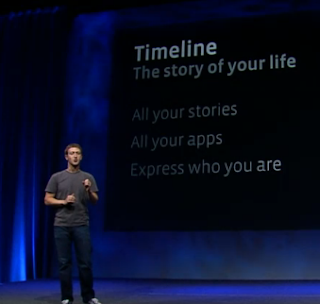 "It is a new way to express who you are," uttered the President of Facebook with a big and proud smile.